Allows seat height to be controlled without touching the adjustment lever by hand. Often used in sterile clinical and surgical environments. Allows the height of a chair or stool to be controlled without touching an adjustment lever by hand. Recommended for sterile and surgical environments. 28mm top taper and 50mm bottom taper fits most, but not all, office chairs and stools. Please check your chair dimensions carefully. Cannot be used on stools or chairs equipped with a foot ring. 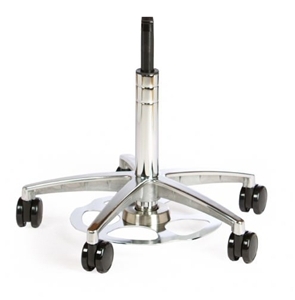 5-star chair base must have sufficient clearance to accommodate the movement of the foot plate. A compatible chair base is available separately. Recommended for applications where the user keeps the chair in one spot. Not recommended for applications where the user must navigate around the work area while in the seat. It is VERY easy to activate the footplate. The seat could lower unexpectedly if you inadvertently activate the footplate while moving in the work area while in the seat. Important! Height recommendations are approximate and will vary depending on the depth of the seat pan + mechanism. The following size recommendations are for a seat pan + mechanism height dimension of 8". On some chairs the cylinder can be safely pounded away from the seat and base with a mallet. However, we recommend using special tools to disassemble the chair in order to avoid damage to the chair components. The manufacturer warrants this product for five (5) years against defects in materials or workmanship which arise during the course of regular indoor use. The purchaser's sole claim shall be for repair or replacement, at the sole option of the manufacturer, of any defective product covered by the warranty.